My interest in art began early. At age seven I had a drawing of a dog, “with eyes as big as sewer lids”, published in the Denver Post. That same year I won my first award - a pack of Juicy Fruit gum - for a clay sculpture of a cowboy sitting on a fence and twirling his lasso overhead in a school composition. At age eleven, I drew the monthly comic strip for the school paper. This interest continued throughout my school years. After serving in the U.S. Army, I studied sculpture and painting at Metropolitan State College in Denver. After receiving a B.F.A. degree, I continued what I did in college by making constructivist paintings. These were exhibited in many shows. I also screen printed, art directed, sign painted, illustrated a few books, took two solo bicycle trips across the United States and Canada, and built a three story cabin by hand. My neighbors called this cabin a lodge, I called it a giant sculpture. Since 1989, I've been painting full-time. 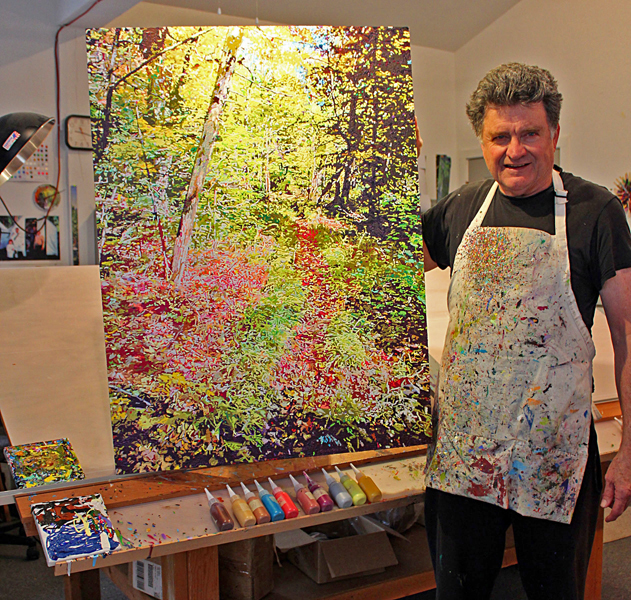 My paintings begin by visiting colorful natural areas. There I hunt for scenes with my camera and numerous photos are taken. Back in the studio, key photographs are selected that will become paintings. Grid patterns are then laid out on the photo. On the painting surface a larger corresponding grid is drawn. This sets the stage for paint application. I do not rely on my own illusion for the painting. What is there on the photo is generally what I paint. The only difference is that acrylic colors are are selected that give the work an impression of vibrancy. The grids on the canvas are painted with accurately placed tiny shapes of color reminiscent of "pointillism". Sometimes this painting process can be tedious, but it is a stable, and not many paintings fall apart in front of me. During the process, I am usually not aware of painting a tree or rock, but only distributing paint to the surface. Before the painting is finished, every void on the canvas is filled with tiny slashing strokes of vibrant color. Up close, each swatch of paint on canvas appears haphazard, but from a distance the viewer's eye mixes the colors to form recognizable shapes. There is a balance between abstraction and realism. In the past, all color was applied with a #2 liner brush. Lately, I have been applying the paint with dispensers. This method results in thicker more textured paint and pure hues of color. There is also less detail in the finished work. In 2003, I purchased a historical schoolhouse near Seaside, Oregon. After renovation, it makes a wonderful studio/home with its high ceilings and abundant square footage. It will be my studio of the Northwest. With its nearly three acres of woods and gardens, it will be also become my Giverny. Living in a schoolhouse has not made me any smarter, but I find that the humidity in Oregon makes working in acrylic much more forgiving than the dry climate of Colorado.